Clean alkyd paint from roller covers and cages before the paint dries. Use solvent (like paint thinner) to clean alkyd paint from roller covers and cages, because plain soap and water don’t work. Cleaning with paint thinner can be quite messy. Work in a garage or outdoors, if you can. Be sure that wherever you choose is protected and well ventilated. 1Gather your materials: Latex or nonlatex gloves, goggles, dropcloths, 3 plastic containers, paint thinner, a 5-in-1 tool, used roller cover and cage, paint container, and paper towels. The plastic or metal containers should be large enough to accommodate a roller cover laid flat. 2Protect yourself and the area. Put on your gloves and goggles, and lay down newspaper or dropcloths to protect your work surface. 3Half fill the three containers with paint thinner. 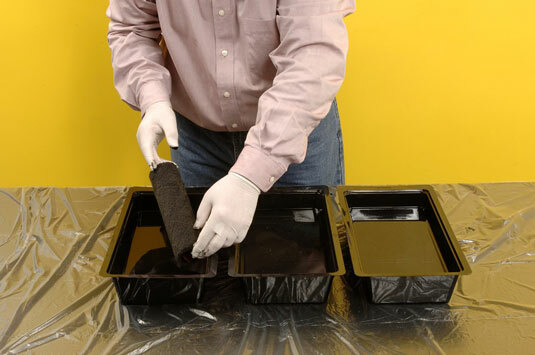 Fill three containers with enough paint thinner or mineral spirits to cover a roller cover laid flat. 4Scrape off excess paint from the roller. 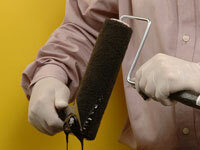 Use the curved edge of your 5-in-1 tool to scrape paint from the roller cover back into the paint container. 5Set the roller cover in the first container. Slip the roller cover off the cage and into the first tray of paint thinner. Let it soak for five minutes, wiggling it around periodically. Set the cage aside for now. 6Remove excess paint thinner from the roller cover. Remove the cover and scrape excess liquid into the container with the 5-in-1 tool. Wipe off the cover with paper towels. 7Repeat Steps 5 and 6 using the second container. Lay the cover in the second container. Let it soak for three minutes and then wiggle it. Scrape off excess thinner and pat dry. 8Rinse the cover in the third container. Put the brushes into the third container, and let them soak for three minutes. Wiggle them once or twice. The liquid should be clean. 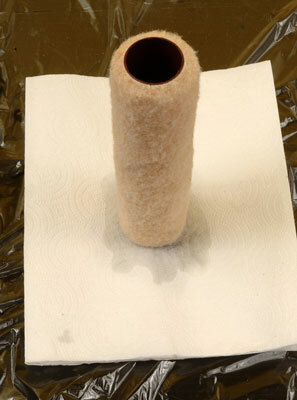 Repeat Step 6, and then stand the roller cover on its end atop a stack of paper towels to dry. Be careful! If you stand the cover on newspaper, you could reactivate the ink in the paper and ruin your cover. 10Place the roller cage in the first container. Let the roller cage sit in the first container of paint thinner for two minutes. 11Remove the roller cage and dry it. Wipe the roller cage with paper towels to remove loose paint. 12Repeat Steps 10 and 11 using the second container. No paint should appear on the paper towels at this point. 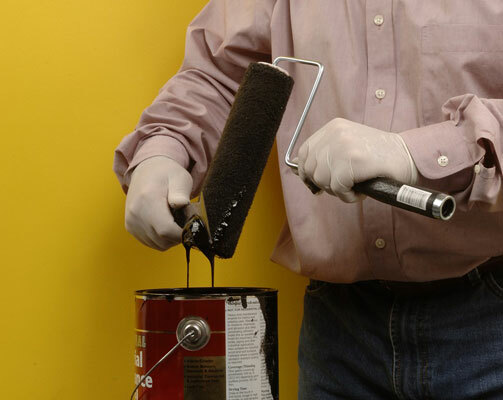 If there is still paint, repeat Steps 10 and 11 using the third container.